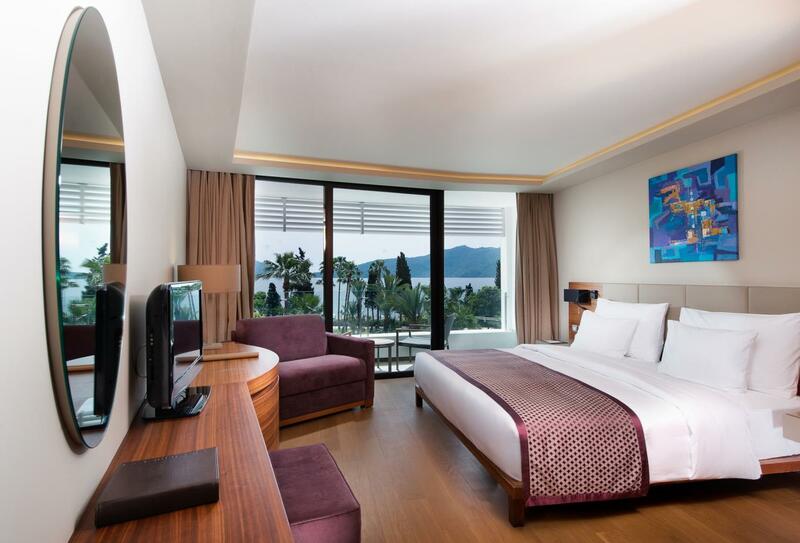 D Resort Grand Azur Marmaris is just a short stroll from Marmaris city centre in Mugla Province, with many fantastic attractions nearby including the Marmaris Mountains, Icmeler Beach and the Carian Trail. 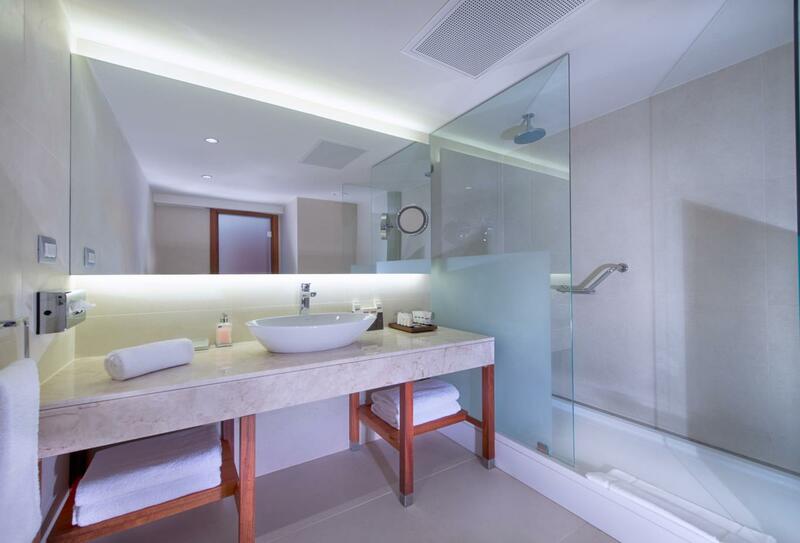 Rooms and suites have been designed to feel spacious, airy and comfortable with stunning views of the sea or land, with private balconies in each room. The restaurants and bars offer you plenty of choice when it comes to dining, including Turkish and international cuisine in Palmiye Restaurant, 21 day matured steaks in Steak & Bar and the wonderfully serene and quiet Maritime Bar to enjoy afternoon tea. Leisure offerings are abound here, including an outdoor pool with a waterslide, a large indoor pool and three tennis courts. Azur SPA and Fitness also offers relaxing massages, face and body treatments, and a fitness centre with everything you need to keep in shape. 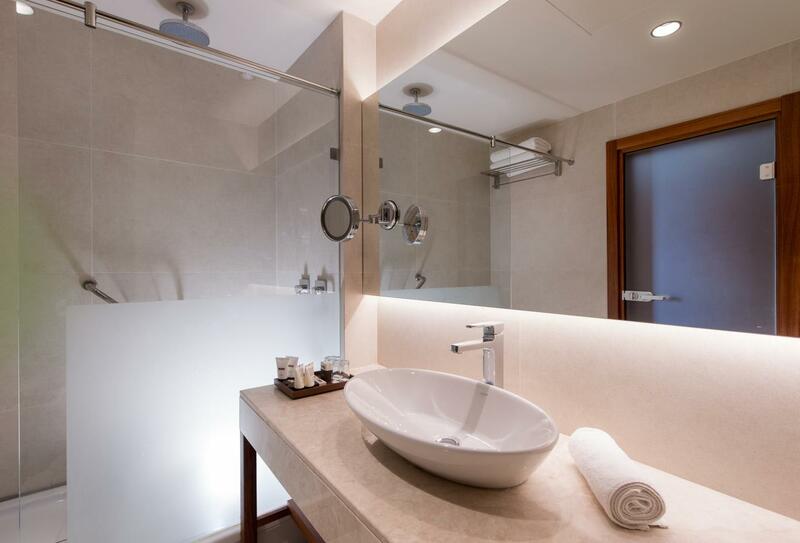 These standard rooms offer contemporary elegance, with light décor and views out onto the sea. With contemporary décor and modern amenities, the Standard Land View offers a private balcony with views onto the resort grounds. This spacious suite offers a separate bedroom and living room for plenty of living space, both indoors and out with your private balcony overlooking the resort gardens. 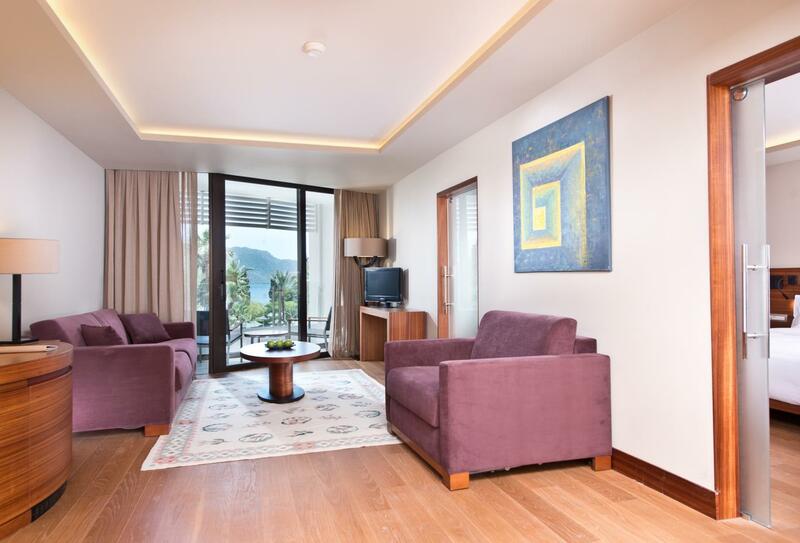 With superb views over Marmaris Bay and plenty of living space, these suites are designed to make the most of the natural sunlight which fills the room from the private balcony. Open for breakfast, lunch and dinner, Palmiye Restaurant serves a delicious buffet selection as well as a la carte dining with Turkish and International flavours. The restaurant is sat in the beautiful resort gardens and dinner is accompanied by live music. 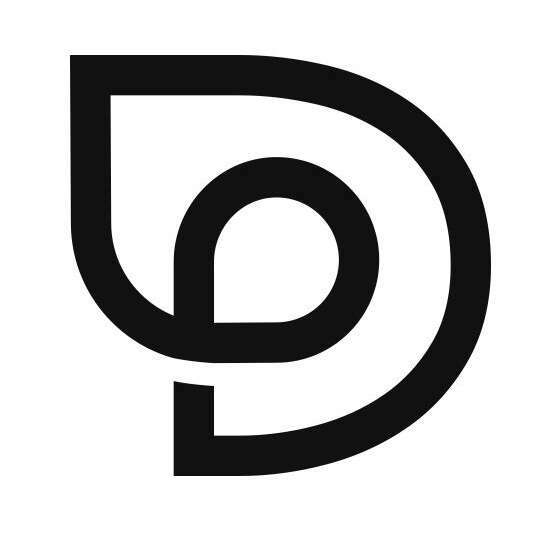 Open 07:00-22:00. 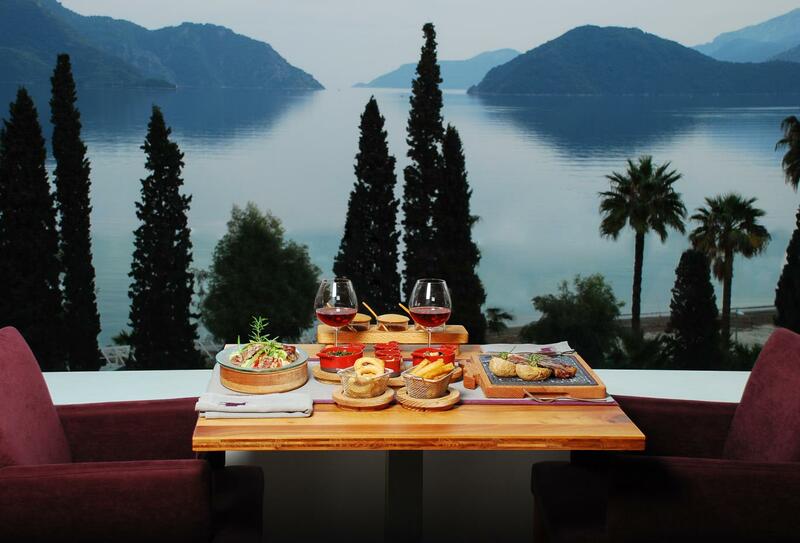 On the top floor of the hotel giving spectacular views over Marmaris Bay, the Steak and Bar Restaurant serves mouth-watering steaks and rich wines for distinctive culinary tastes. Open 19:00-23:00. Serving a la carte snacks and refreshing beverages by the pool, throughout the afternoon. Open 12:00-16:00. Sat delicately on the Blue Flag beach, The Beach Bar serves a la carte snacks and cool drinks throughout the day and into the night. Open 10:00-22:00. With a vast range of both alcoholic and non-alcoholic beverages, as well as hand-crafted cocktails, fine wines and premium Champagnes, the Lobby Bar offers a cosy atmosphere and live pianist performances. Open 09:00-01:00. One of the quieter spots of the hotel where you can cool off from the sun, the Maritime Bar serves delicious pasties, light snacks and hot and cold beverages. Open 09:00-01:00. 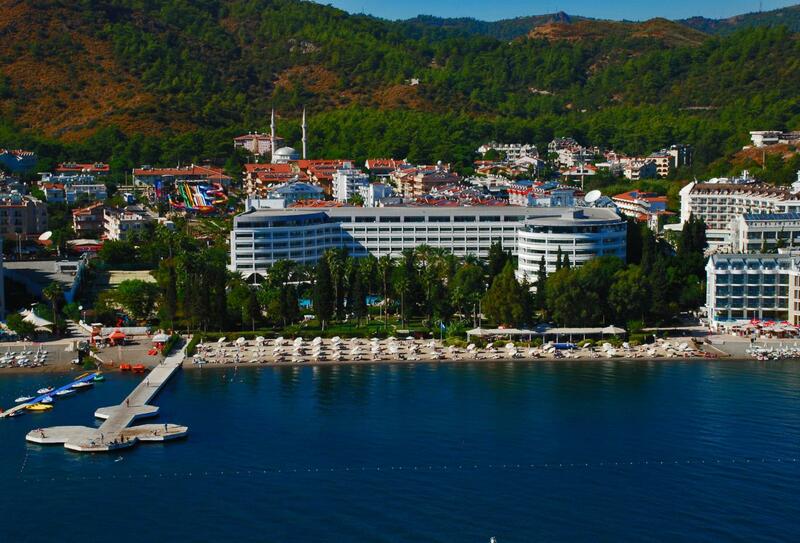 The property is 2km from Marmaris city centre in Mugla Province in south-western Turkey. 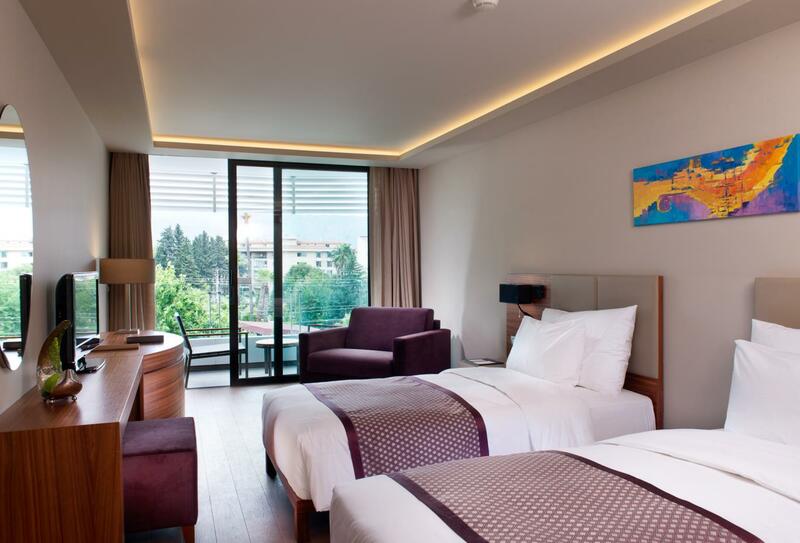 It is 75 minutes (90km) by car from Dalaman International Airport and 105 minutes (130km) from Bodrum International Airport.